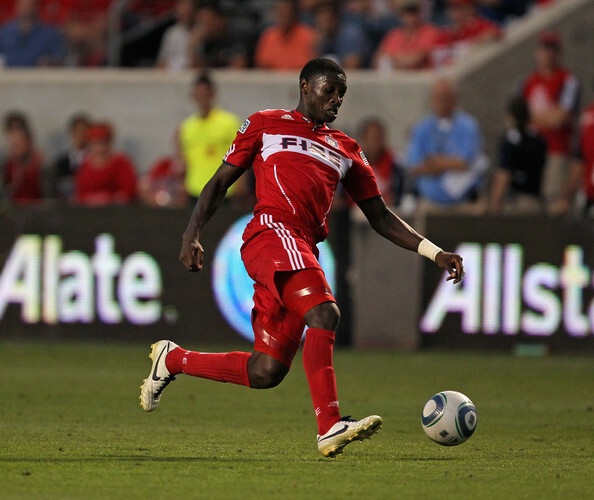 BRIDGEVIEW, Ill. -- It was not the smoothest of performances for the Chicago Fire. But the home side did its job on Tuesday in topping the USL Pro's Richmond Kickers, 2-1, in the semifinals of the Lamar Hunt U.S. Open Cup at Toyota Park. "It was a scrappy one, but we got it done," Fire defender Jalil Anibaba said. Sebastian Grazzini netted a first-half penalty-kick goal and Dominic Oduro tallied a second-half game-winner as Chicago advanced to its sixth Open Cup final appearance. The Fire have won the Open Cup four previous times (1998, 2000, 2003 and 2006) and were the runners-up in 2004. "Opportunities like this, you can't let them slip away," Fire interim head coach Frank Klopas said. "It was a special moment for the team, for our fans obviously, to put ourselves in this situation now in the final, to have an opportunity to win something. We knew what was at stake. Eclipse Select Soccer Club alumna and Crystal Lake, Ill., native Amy LePeilbet was called up to the U.S. Women's National Team roster on Monday as part of a WNT "Celebration Series." The Americans prepare for matches against Canada on Sept. 17 at Livestrong Sporting Park in Kansas City, Kan., and on Sept. 22 at Jeld-Wen Field in Portland, Ore.
LePeilbet is coming off a runner-up finish in the 2011 FIFA Women's World Cup. The 2009 and 2010 Women's Professional Soccer Defensive Player of the Year advanced to this year's WPS postseason. But LePeilbet's Boston Breakers fell to magicJack, 3-1, in the first round of the playoffs. BRIDGEVIEW, Ill. -- The four-time Lamar Hunt U.S. Open Cup champion Chicago Fire have touted their best available lineup throughout this year's tournament. The same cannot be said for some other MLS squads, and you only have to look at the Fire's 4-0 quarterfinal win over a reserve-laden New York Red Bulls side on July 12 to come to that conclusion. But the semifinal round will not have that type of aura to it as Chicago hosts the USL Pro's Richmond Kickers on Tuesday at Toyota Park (broadcast available at Chicago-Fire.com). Being the only non-MLS team remaining in this year's tournament, the Kickers no doubt will try everything to halt the Fire's deepest run in the Open Cup since their 2006 championship over the Los Angeles Galaxy. "This is a tournament that we take very seriously," Fire interim head coach Frank Klopas said. "This has been one of our goals from the beginning, to put ourselves in a position to win the U.S. Open Cup. Now we have a great opportunity on Tuesday. We're not going to underestimate anyone." BRIDGEVIEW, Ill. -- Don't look now, but the Chicago Fire have put together a stretch of victories. Dominic Oduro and Cory Gibbs each netted a goal and Chicago topped the Colorado Rapids, 2-0, on Saturday in front of 15,211 at Toyota Park. It marked the first set of back-to-back wins for the Fire (4-7-15, 27 points) since the 2010 season, when they topped D.C. United and the Houston Dynamo on April 17 and 24, respectively. While the Fire are building some needed momentum, the team knows it has to make up for some lost ground in getting back into the playoff picture. 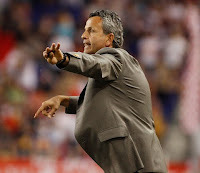 "It's one game," Fire interim head coach Frank Klopas said. "The guys are not satisfied. We're not satisfied. This is behind us. We have to look at this match and look at the good things and what we have to improve." BRIDGEVIEW, Ill. -- It has been 16 months since the Chicago Fire have posted back-to-back victories. They have an opportunity to put an end to that trend when they host the 2010 MLS champion Colorado Rapids on Saturday at Toyota Park. Saturday's match marks the start of a Western Conference-heavy schedule over the next month. After Saturday, Chicago takes a two-week break from MLS action but hosts the USL Pro's Richmond Kickers on Tuesday in a Lamar Hunt U.S. Open Cup semifinal. The Fire have posted a 1-0-1 mark on their current homestand, most recently earning a 2-0 win against Toronto FC last Saturday. 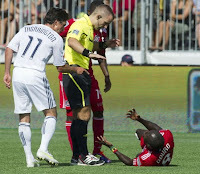 BRIDGEVIEW, Ill. -- Chicago Fire interim head coach Frank Klopas made it clear following the team's 2-0 win over Toronto FC on Sunday where he prefers to play rookie defender Jalil Anibaba. "I like him better as a center back," Klopas said of Anibaba, who opened the season as the Fire's regular right back. "He reads the game better there. For me, I think he can play both. But I see him as a better center back than on the right." Anibaba's move to center back has been a smooth one, and that was evident when out of the blue he had to replace an injured Cory Gibbs in the opening minutes of a 1-1 draw against the Philadelphia Union on Aug. 3. "In college, I was able to grow in that position more," Anibaba said. "When I made the transition to center back from attacking mid (where he played in his first two games at Santa Clara), it wasn't easy for me just because it takes time to get used to a new position. It's just a matter of me having more games underneath my belt at center back, and I've been able to transfer my experiences from college at center back to this level." BRIDGEVIEW, Ill. -- Defender Dan Gargan was a bit of a mystery man when he was traded to the Chicago Fire from Toronto FC on July 28. Chicago appeared to have its defensive group set in stone. Rookie Jalil Anibaba and team captain Logan Pause manned the right back position, and Gonzalo Segares has been the season-long fixture at left back. So it was unknown as to what extent Gargan's immediate impact would be. Some could argue that when the Fire sent Dasan Robinson to Toronto, the inclusion of Toronto's 2012 second-round draft pick looked like the most enticing part of the entire deal. But Toronto's loss already has become Chicago's gain. 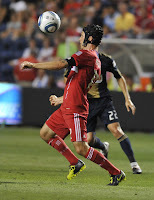 Gargan has started at right back during the Fire's past three matches, posting a 1-0-2 record. 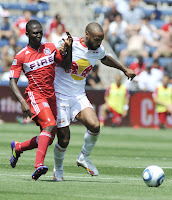 Gargan also tallied a goal against his former Toronto squad on Sunday en route to a much-needed 2-0 Fire win. It was an uplifting moment for the Fire, who earned only their third victory of the season. "The moment was definitely heightened because of the [winless] run we've been on," Gargan said. "That goal took a little bit of the pressure off of us to win. That's definitely the most important -- getting those three points and hopefully getting us on the right side toward winning games for a little run that we need to go on." BRIDGEVIEW, Ill. -- The Toyota Park scoreboard was not a mirage. The Chicago Fire finally found the win column for the first time in more than two months as they defeated Toronto FC, 2-0, on Sunday in front of 12,020 at Toyota Park. Fire forward Dominic Oduro netted a 16th-minute goal, and defender Dan Gargan headed home a goal against his former Toronto team in the 69th minute to garner a long-awaited win for Chicago. "It was huge. We needed it for team morale," Fire defender Cory Gibbs said. "We knew every week we've been playing well during that stretch and needed to get over that hump. Our perseverance is there. We pushed and we got the win. We needed it." BRIDGEVIEW, Ill. -- The Chicago Fire have reached a double-digit winless streak for a second time this season. They are in dire need of a positive outcome when they host Toronto FC on Sunday at Toyota Park. The Fire are in the midst of a 0-3-7 stretch -- the longest winless streak since they posted a 0-4-7 record from April 9 through June 9. Chicago is coming off a 1-1 draw against D.C. United, establishing an MLS record with its 15th draw after conceding a second-half lead. "We've got to keep coming back. I don't think it can get any lower than this," Fire defender Gonzalo Segares said. "We've just got to get up and keep pushing." Fire set record 15th draw vs. D.C.
BRIDGEVIEW, Ill. -- The Chicago Fire enjoyed a lead for less than 15 minutes against D.C. United on Thursday. Then in typical Fire fashion this season, Chicago allowed a second-half equalizer and played to a 1-1 draw in front of 15,818 at Toyota Park. The Fire established an MLS record with their 15th draw of the season, surpassing the previous mark of 14 draws set by FC Dallas last season. "It's not a record we're proud of," Fire defender Gonzalo Segares said. "We've had plenty of chances to win those games and be in a different position." CLICK HERE to vote for CBS Chicago's Most Valuable Blogger Awards 2011. ESPN Chicago's Chicago Fire Report is nominated. Two other Fire-focused outlets also are on the ballot: Chicago Fire Confidential and Hot Time in Old Town. Fire open homestand with D.C. Playing at home or on the road has been a wash for the Chicago Fire thus far this season -- 10 points at home and 10 on the road. But if Chicago had to choose one or the other, the team clearly prefers playing in front of its home base. The Fire play their next four games -- three in MLS action -- at Toyota Park, beginning with D.C. United on Thursday (8 p.m., ESPN2). Pappa says Twente move is 'rumor': Dutch publication De Telegraaf reported earlier this week that FC Twente is interested in Fire midfielder Marco Pappa, with a reported offer of $2.1 million to attain his rights. But the 23-year-old Guatemalan dismissed the report on Wednesday. The Chicago Fire had a rare halftime lead on the New York Red Bulls. But as the trend has been all season, Chicago had to settle for a 2-2 draw on Saturday as the Fire tied an MLS record with their 14th stalemate of the season at Red Bull Arena in Harrison, N.J. The Fire (2-7-14, 20 points) matched the record set by FC Dallas last season, when Dallas posted a 12-4-14 mark in the regular season and advanced to the 2010 MLS Cup against eventual champion Colorado Rapids. Chicago continues to lag behind in last place in the Eastern Conference, and in the grand scheme of things, the Fire clearly are disappointed that they could not hold onto their 2-1 lead in the second half. "If we're being honest, coming into Red Bull Arena and getting a point is a positive," Fire captain Logan Pause said. "We'd only be doing ourselves a disservice if we had our tails between our legs and started writing games off. But tonight we needed three points." BRIDGEVIEW, Ill. -- Will the real Chicago Fire please stand up? A topsy-turvy five-day stretch last week brought out the Fire's best efforts (1-1 draw against the Philadelphia Union) and easily the team's worst performances (4-2 loss to the expansion Vancouver Whitecaps) of the season. Which version shows up this Saturday remains to be seen as Chicago faces the New York Red Bulls at Red Bull Arena in Harrison, N.J.
"It's amazing, because you go from playing the [second-place team in the East] and dominating that game and playing really well, and then going on the road where for me it was a very poor performance," Fire interim head coach Frank Klopas said. "Not the fact that we lost. I just felt the discipline and the stuff that we worked on, we gave up opportunities too, too easy. When you do that and give up four goals, it's difficult to win any game." The Women's Premier Soccer League announced Friday that Chicago Red Stars forward Michele Weissenhofer (Naperville, Ill.), midfielder Amanda Cinalli (Cleveland, Ohio) and defender Jackie Santacaterina (Geneva, Ill.) have been named to the All-WPSL First Team. All three players were named to the WPSL All-Midwest Conference Team on Thursday. Weissenhofer led the Red Stars in points (30) and assists (10), and tied for the team lead in goals (10) in 13 games played. Cinalli had 10 goals, two assists and 22 points in 13 matches. And Santacaterina contributed a goal and anchored a Red Stars defense that allowed only seven goals in 13 games, including a six-game shutout streak heading into the WPSL Semifinals. 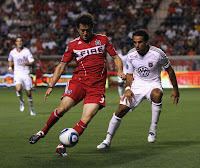 BRIDGEVIEW, Ill. -- The Chicago Fire so often have had to quickly put the past behind them to rebound from a poor effort. But Sunday's road loss to the expansion Vancouver Whitecaps appears to have lingered just a bit more than usual. "We just didn't come mentally prepared that day and it showed," Fire midfielder Patrick Nyarko said Wednesday following training. "It cost us big time. We had a series of meetings [this week], and the guys reminded themselves that it wasn't good enough." Chicago is preparing for a road match against the New York Red Bulls this Saturday, and mental preparation clearly is an area where the Fire turned in a failing grade against the Whitecaps. "The mentality at this level is the difference maker," Fire defender Logan Pause said. "You give up a goal 30 seconds in, it doesn't feel good. You're starting off with a massive hill to climb. You even it up and you do it right again. Sean [Johnson] makes a huge save on a penalty to keep us in it, and within five minutes of the second half [we give up a goal]. So it's one of those things where we kept taking punches, and I think how we fought back, or the lack of energy and commitment, was frustrating to be a part of." Chicago Red Stars forward Michele Weissenhofer (Naperville, Ill.) was named the Women's Premier Soccer League Midwest Co-Player of the Year, and Red Stars Head Coach Rory Dames was named WPSL Midwest Coach of the Year after guiding Chicago to a runner-up finish in the 2011 WPSL National Championship on July 31 at Benedictine University. Weissenhofer, Red Stars midfielder Amanda Cinalli (Cleveland, Ohio) and Red Stars defender Jackie Santacaterina (Geneva, Ill.) were named to the All-Midwest Team. Weissenhofer shared the Midwest honor with FC Milwaukee Nationals forward Sarah Hagen. Weissenhofer had 10 goals and 10 assists during the 2011 campaign, and she factored into all of the Red Stars' goals during the WPSL Semifinal and Championship. 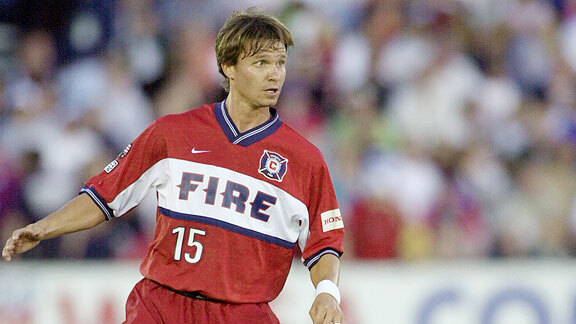 Former Chicago Fire midfielder Jesse Marsch was named the Montreal Impact's head coach on Wednesday as the team prepares for its first MLS season in 2012. 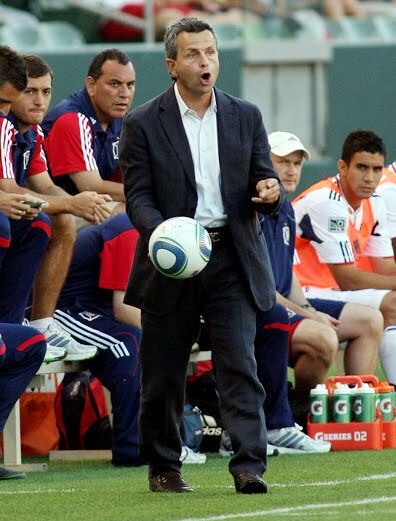 "It's an honor to be named the first head coach of the Montreal Impact in MLS," Marsch said in a release. "It's a great opportunity to establish something special. There are good soccer people in this organization that are committed to doing things the right way. My time in MLS and with the U.S. National Team exposed me to this game at the highest level. We will be committed to the process of becoming a winning team." Klopas says Fire not focused on coaching search: With Montreal taking care of its coaching situation for next year and the Vancouver Whitecaps announcing this week the hiring of Martin Rennie, all eyes are on what the Fire's coaching situation will be for 2012. Fire interim head coach Frank Klopas said following Wednesday's training that it is not even a topic of discussion right now as the Fire are looking to dig out of its last-place position in the Eastern Conference with a 2-7-13 record. "We need to focus on the next 12 games and the [Lamar Hunt U.S. Open Cup] semifinal here," Klopas said. "Obviously that's our main focus. When that's over, then we'll look at the next step, the next thing." Chicago Fire interim head coach Frank Klopas and former head coach Carlos de los Cobos have been at the helm for 11 games apiece this year. So this is an opportune moment to take a look at how things have changed -- or not changed -- under their leadership this season. De los Cobos was fired on May 30 after 11 matches and a 1-4-6 record (nine points). He was dismissed following a 0-4-5 stretch that included a winless May against teams such as the expansion Vancouver Whitecaps, Toronto FC and the San Jose Earthquakes. Klopas has not fared much better. As the interim head coach for the Fire's past 11 matches, the team is 1-3-7 (10 points). His club is dead last in the Eastern Conference with a 2-7-13 record and 19 points. And with a double-digit points deficit separating Chicago from a playoff position based on the current standings, the Fire likely will miss the postseason for a second straight year. The Chicago Fire struggled mightily against Major League Soccer's expansion clubs this season. And unless there is a miraculous stretch somewhere within this Fire roster, Sunday's effort against the Vancouver Whitecaps likely spelled the end toward any playoff aspirations. The Fire fell to Vancouver, 4-2, at Empire Field and were winless this season against MLS's two new clubs, posting a 0-3-1 record against the Whitecaps and Portland Timbers. The lone point was a scoreless draw against Vancouver. Up to this point, Fire interim head coach Frank Klopas' squad had done its job on the defensive side. But Chicago (2-7-13, 19 points) posted its worst performance in the defensive third this season in a battle between the two last-place teams in their respective conferences. "I don't know what happened," Fire left back Gonzalo Segares said. "We've been strong defensively in our last games, and today we were just terrible. We made mistakes, we didn't concentrate. It's just tough because we went down so quickly, we tried to fight back, and immediately we were down again. It takes a toll on you." 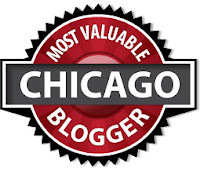 BRIDGEVIEW, Ill. -- The theme around the Chicago Fire locker room during the midweek was toward forging ahead in the midst of a disappointing outcome. The players certainly have had to cope with quite a few, and their most recent effort was out-playing the Philadelphia Union on Wednesday, only to manage a 1-1 draw. Now the Fire hit the road to take on the expansion Vancouver Whitecaps on Sunday at Empire Field. 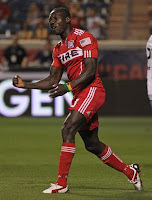 "We cannot dwell on it," Fire midfielder Patrick Nyarko said. "We've got to look forward. Every point dropped hurts, but we've got to move on." "It seems like it's been a little bit of a recurring theme this year," Fire captain Logan Pause said. "We don't have enough time to hang our heads and get upset and worry. ... At this stage, ties aren't really helping. We know we need to get three points." BRIDGEVIEW, Ill. -- Chicago Fire interim head coach Frank Klopas wasted no time in getting his newest midfielders Sebastian Grazzini and Pavel Pardo into the mix. At this stage, the last-place Fire (2-6-13) need to throw out all the punches with 13 matches remaining on the season. Chicago is coming off a 1-1 home draw against the Philadelphia Union on Wednesday. The Fire were the better team in the run of play, and much of the credit can be directed toward Grazzini. "He can create, he can make the final pass -- he's dangerous," Klopas said. "He's exciting for the fans to watch. Definitely brings something different to the table." BRIDGEVIEW, Ill. -- The Chicago Fire dominated on the attack and had one of their best stretches of passing and movement of the season. But the Philadelphia Union capitalized on its one half-chance and the two sides played to a 1-1 draw in front of 10,557 at Toyota Park on Wednesday. 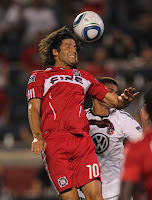 Fire defensive midfielder Pavel Pardo tallied a game-tying goal in his Chicago debut to salvage the draw. But it was Veljko Paunovic's 34th-minute tally for the Union that was a bitter pill to swallow from the Fire's standpoint. "It's disappointing because time is running out, for sure," Fire interim head coach Frank Klopas said of the team's current last-place stance in the Eastern Conference. "That's why with the break, I think we felt good coming into this game. The urgency was there, the desire, so I'm happy about that." CHICAGO - Chicago Red Stars midfielders Julie Ewing and Kara Kabellis and defender Sammy Scofield were named to the 2011 WPSL All-Championship Team. 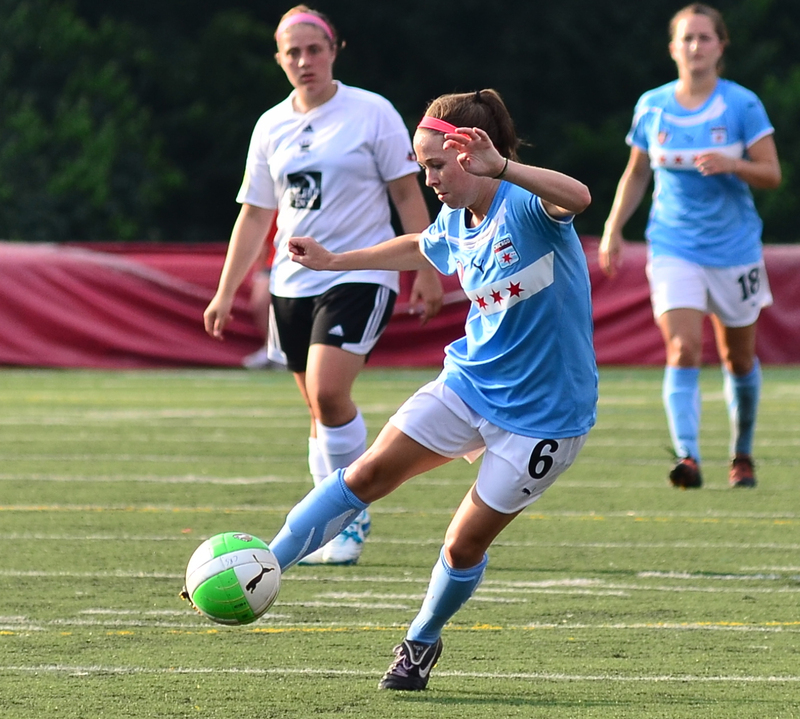 Ewing in particular had a standout Championship weekend for Chicago, scoring two of the Red Stars' three goals in the final two matches, including a dramatic 88th-minute tally in the WPSL National Championship to force overtime against the Orange County Waves. Red Stars forward Michele Weissenhofer, who had a goal and two assists, was an honorable mention selection.